The screen shot above depicts a service record example for Google Domains. Most of the fields in this dialog are self explanatory, but some fields require brief explanations. Record Username, and Record Password: The Record Username, and the Record Password fields are both comprised of random alpha-numeric characters. They were assigned to you by Google Domains when you registered your domain name. Follow the following steps to locate them. Login at domains.google.com using your credentials. At the target domain row, select the "Configure DNS" icon. Scroll down to the "Synthetic Records" section. Select the "Dynamic DNS" link for the target domain name. Select "View Credentials" to view the record username and password. 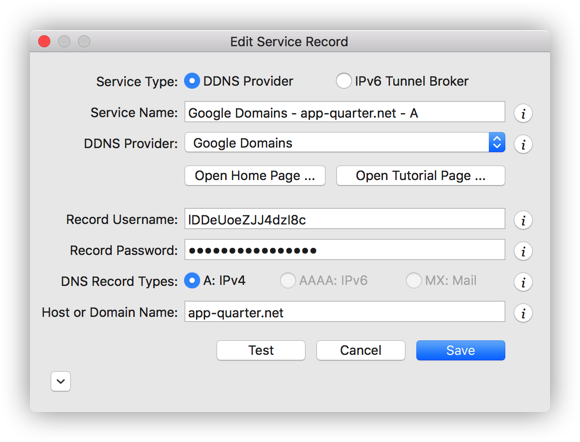 DNS Record Types: Google Domains supports dynamic DNS records of type A.